During the evening, scholarships and awards were handed out, including the Victor Truesdale Award, which was presented to Jocelyn Orr (21) from Saintfield, County Down. 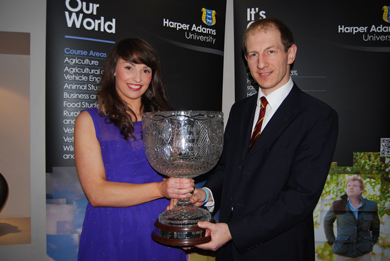 The award is presented to a final year student from Ireland who has made the greatest contribution to university life while studying at Harper in Shropshire. She said: “I never anticipated I would become so involved in student life at Harper Adams but I couldn’t have made a better choice. “I have loved every minute of my few years at Harper Adams, and to complete my final year receiving this award is the icing on the cake.